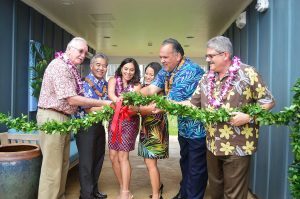 HOUSING PARTNERS: At Kaniko’o on Kaua’i, the governor joins Kevin Carney of EAH Housing, Makani Maeva of Ahe Group, county housing director Kanani Fu, Mayor Bernard Carvalho, and Mel Rapozo, county council chair. Since taking office two years ago, Governor Ige and his administration have taken action on multiple fronts to increase affordable housing and reduce homelessness. This issue of Capitol Connection looks at progress across the state and how groups are working together to make a difference on these long-standing issues. Q. What do you want people to know about progress on housing and homelessness? A. We know the challenge of homelessness is directly related to the lack of affordable housing. I’m focused on working with the private sector to make building affordable units — especially rentals — more feasible. That includes providing tax credits, helping with infrastructure costs, and making state land available. It’s important for the state to be an active participant. Because if government doesn’t help, costs go up. We’re determined to make changes and restructure the financial tools we have. Q. Why is there such a pent-up demand for housing and can the state do more to help? A. There was about a 10-year period — from 1992 to 2002 — when home prices were constant, at about $310,000. All the developers had approved parcels in central O‘ahu and were competing against each other. Once they finished those communities, no one else was producing. Two of the biggest projects — Ho‘opili and Koa Ridge — were delayed. Housing development is complicated when you’re trying to keep prices within reach of the average person. That’s why we’re working with the Legislature to support production and challenge developers to build projects priced for local residents. We also need to focus on the neighbor islands to provide housing people can afford. Q. What does the state’s plan for affordable housing include? A. The state is looking at a range of housing, from the 30 to 60 percent of AMI (area median income) to workforce housing up to 140 percent AMI. That could apply to a teacher and a firefighter who have solid jobs. The Hawai‘i Housing Finance and Development Corporation has rental projects in the pipeline for people who are at the low end of the salary range. The Hawai‘i Community Development Authority is working on a formula in Kaka‘ako that makes sense for both the builders of affordable units and the people who need them. We’re also making advances in public housing and the Department of Hawaiian Home Lands. Q. Are you encouraged by the state’s efforts to reduce homelessness?